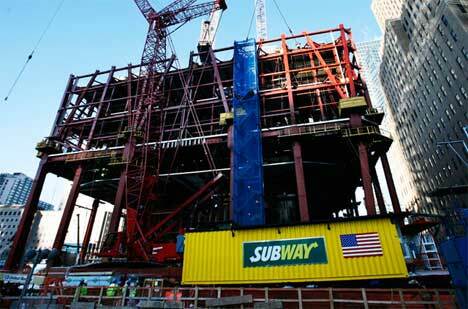 There may be no such thing as a free lunch, but a Subway sandwich shop made of shipping containers is helping workers at the World Trade Center building site get their noontime grub on more efficiently. The shop will rise along with the building’s construction to its eventual 108-story height, making it easier for construction workers to grab lunch. They don’t have to descend to ground level to grab a bite, so they can spend their 30-minute lunch breaks actually enjoying lunch. The unique Subway shop is made up of nine shipping containers. The three-story structure – complete with an eating area and a compost unit to recycle waste – is perched on a hydraulic platform in the middle of the building’s frame. Like all other Subways, this one features fresh, baked-on-site bread. It also features a full menu, but will provide workers with some menu items not available at any other Subway: hot dogs, hamburgers and New York pretzels. The Freedom Tower, more formally known as One World Trade Center, will be the main building at the former World Trade Center site. 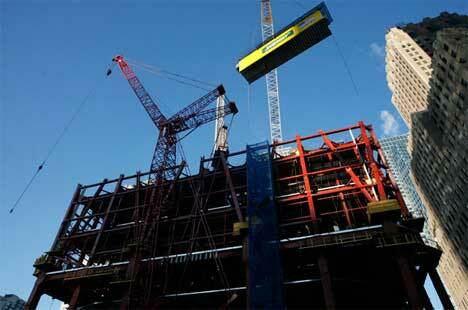 The building has been under construction since 2006, but only recently did the construction reach a significant height above ground level. 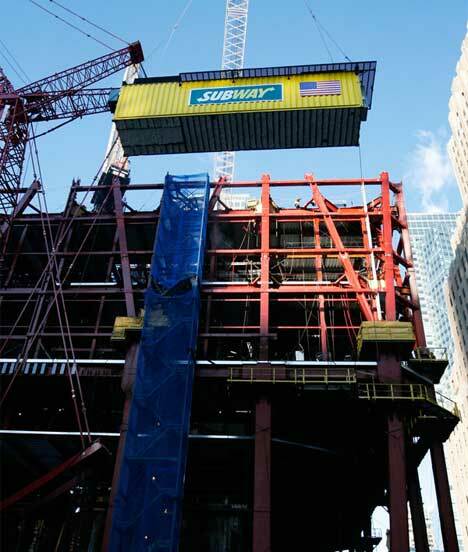 In December of 2009, this Subway restaurant was put together to make lunchtime easier for the builders: when the structure is nearly complete, it will take around 45 minutes to get to the bottom from the top. The on-site eatery gives workers tasty, fresh food without having to spend their entire lunch break traveling to and from a restaurant. Although the high-rise hoagie shop is great advertising for Subway, the restaurant got the contract because they were willing to take on the project at cost. They’re not making a profit on the food, but they are giving workers a welcome break from cold meatloaf sandwiches. And as for the restaurant itself, it’s one of the most creative uses of shipping container architecture we’ve seen yet.